The Steelers score their first TD in a season opener in 3 years and terrorize John Friesz, limiting him to only 75 yds passing through 3 quarters. San Diego trails 19-3 before scoring 17 points in the final 10 minutes, but the outcome is never really in question. Brister (13 of 21, 181 yds, 1 TD) throws INTs on consecutive passes in the 1st half but bounces back with a 33-yd TD pass to Calloway in the 2nd. Brister gets sandwiched and goes out with a concussion midway though the 4th and O'Donnell comes in and throws a screen to Dwight Stone, who picks up a great block from Lipps and blazes 89 yds for a 26-13 Pittsburgh lead with 1:30 left. Footage includes some postgame material. Thanks to Jay Korber for generously providing this game! Jim Kelly throws for 363 yds and a career-high 6 TD passes -- 4 to Don Beebe (10 catches, 112 yds) -- as the Buffalo piles up 537 yds of offense and scores their 2nd-highest point total ever. Despite Buffalo's offensive fireworks, Pittsburgh uses a pair of 3rd-quarter INTs (Woodson and Hinkle) to narrow the score to 31-27 heading into the final period. 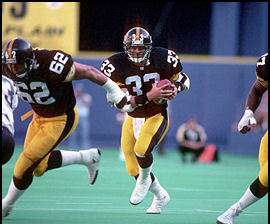 But Kelly's 3rd and 4th TDs to Beebe snuff out any hopes of a Steeler comeback. The game is tied 6-6 until Bubby Brister (22 of 29, 262 yds, 1 TD, 0 INT) hits Eric Green for a 32-yd TD early in the 4th quarter. Green catches the pass at the 15, tiptoes down the sideline and then surges past a pair of Patriot defenders for the score. New England seals their fate when their punter, under a heavy rush, kicks the ball into the back of his own blocker and rookie Ernie Mills recovers in the end zone for the game's final score. Thanks to Jay Korber for generously providing this game! Despite their new head coach, it's the same old story for the hapless Colts as the Steelers spoil Rick Venturi's debut. The Colts lead 3-0 at halftime after a shaky first half by Brister. But Bubby finishes strong, hitting all 7 of his 2nd half passes to finish 13 of 16 for 181 yds, including TDs to Eric Green and Barry Foster. Eric Dickerson gains just 24 yds on 13 carries as the Colts fall to 0-6. A special thanks to Jay Korber for generously providing us with this game! Trailing 20-0 and showing nothing offensively late in the 3rd, Neil O'Donnell replaces Bubby Brister and leads the Steelers on a furious comeback, first driving the Steelers to a pair of quick Gary Anderson FGs, then connecting with Louis Lipps for a 16-yd TD to narrow the score to 20-13 with 4-1/2 minutes left. After the defense stops the Giants for a third straight series, O'Donnell leads a 68-yd drive in only 1:29, capping it with a 5-yd TD to Eric Green to tied the score 20-20 with 50 seconds left. But the officials throw a "excessive celebration" flag (one of the most ridiculous rules ever) pushing the kickoff back and in a critical blunder, Anderson kicks the ball out of bounds setting the Giants up with great field position at the 40. Hostetler hits Meggett for 16 and scrambles for 18 more to set up former Steeler Matt Bahr at the Pittsburgh 26, and Bahr hits the 44-yarder with 4 seconds to go. A special thanks to Jay Korber for generously providing us with this game! Dave Krieg completes his first 9 passes and directs two 2nd-quarter TD drives as the Seahawks turn a blocked punt and a fumble into a 17-0 halftime lead. Meanwhile, Neil O'Donnell gets his first NFL start and plays a respectable game (14 of 22, 184 yds, 1 TD, 1 Int) but is unable to duplicate the 2nd-half comeback he led the previous as the Steeler offense constantly shoots itself in the foot with blown assignments, penalties and dropped passes. In one sequence during the 2nd quarter, the Steelers fumble twice, drop 2 passes, commit 2 procedure penalties and give up a sack. A special thanks to Jay Korber for generously providing us with this game! The Steelers start strong, jumping out to an early 10-0 lead, but the Broncos come alive in the 2nd quarter, scoring on 4 consecutive possessions and then holding Pittsburgh to only a FG on 4 drives into Denver territory (including two inside the 10) to hand the Steelers their 4th straight loss. 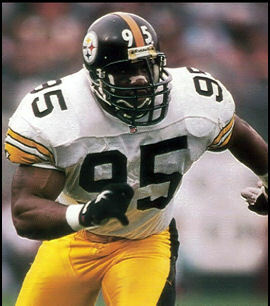 The Broncos sack Neil O'Donnell 6 times and knock him out of the game briefly midway through the 4th quarter, but O'Donnell comes back to drive the Steelers from their own 8 to the Denver 9 in the final minute of the game. Unfortunately, O'Donnell throws 3 straight incompletions and Charles Dimry knocks away a 4th-down pass intended for Eric Green in the end zone with 41 seconds left to preserve the win for Denver. A special thanks to Jay Korber for generously providing us with this game! O'Donnell gets his first victory in 4 NFL starts by rallying the Steelers with 2 TD passes in the final 8 minutes of regulation, hooking up with Ernie Mills for a 35-yd TD and a 12-yarder to Louis Lipps to give the Steelers a 27-24 lead with 1:24 to play. Jim Breech ties the game on a 47-yd FG with 5 seconds left in regulation to send the game to overtime. Greg Lloyd sets up the game-winning TD when he strips the ball away from Ickey Woods after a short pass, scoops up the loose ball and returns it 19 yds with a facemask penalty against the Bengals tacked on to move the ball to the Bengal 29. Two plays later, Eric Green gathers in a 26-yd TD pass from O'Donnell to give the Steelers an exciting overtime victory. Thanks to Jay Korber for generously providing us with this game! Mark Rypien completes 21 of 28 for 325 yds and 2 TDs as the mistake-free Redskins dominate both sides of the ball and improve to 11-0. Washington's defense keeps Pittsburgh on its side of the 50 for all but two plays of the first half and sacks Neil O'Donnell 5 times, dominating time of possession by over 14 minutes and outgaining the Steelers by nearly 200 yds. Thanks to Jay Korber for providing us with this game! The Steeler defense takes advantage of 20 m.p.h. winds and a 12-degree wind chill in the snow, harassing league-leading passer Warren Moon into 6 turnovers (5 INTs and a fumble). Despite throwing for 324 yds, Moon's gaffes lead directly to 16 points for Pittsburgh (3 Gary Anderson FGs and a TD) and prevent the the Oilers from clinching of the AFC Central title (for now). Neil O'Donnell connects with Dwight Stone on a 43-yd TD with 51 seconds left in the 1st half to give the Steelers a 16-7 lead at halftime. Thanks to Jay Korber for providing us with this game! The Steelers, who struggle early and trail 10-0 at halftime in this Thanksgiving Day matchup, fight back and sieze the momentum late in the 2nd half, narrowing the score to 13-10 with 8 minutes left in the game on a 3-yd TD run by Warren Williams. But facing a 3rd and 10 at their own 34, Steve Beuerlein -- subbing for an injured Troy Aikman -- finds Michael Irvin (8 catches, 157 yds) cutting across the middle and hits him in stride for a 66-yd TD. Gary Jones misses a tackle and Irvin shakes off Rod Woodson at the 15-yd line to score standing up. Emmitt Smith is a workhorse, racking up 109 yds and a TD on 32 carries. Bubby Brister gets the start after refusing to play mop-up the previous week late in the blowout loss vs. Houston and throws 2 TDs as the Steelers overcome 5 turnovers (thanks to 2 INTs by Brister and Tim Worley's ongoing fumble-itis) to squeak out a win against the hapless Bengals. Brister hits TE Adrian Cooper on a short pass that Cooper takes 47 yds for a TD on the Steelers' 3rd snap of the game, then hits TE Keith Cash late in the game for a 19-yd TD to break a 10-10 tie and secure the win. Thanks to Jay Korber for providing us with this game! Farewell to the Emperor! 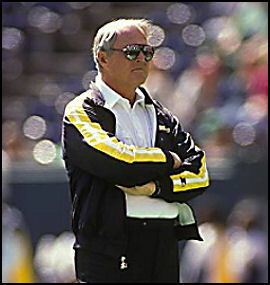 An opportunistic Steelers defense gives Chuck Noll a win over the Belichick-coached Browns in Noll's final game. Bubby Brister completes only 7 of 26 passes for 113 yds, but one of his completions is a nice little slant to speedy Dwight Stone who picks up a fantastic block from Louis Lipps and takes it 65 yards for the score in the 3rd quarter. And while Brister's counterpart Bernie Kosar throws for 335 yards, Cleveland's 5 turnovers (3 INTs) are too much to overcome. Gary Anderson has an uncharacteristically bad day, going 1-4 on FGs. Thankfully, CB Richard Shelton has the game of his life by snagging the only 3 interceptions of his career, the last of which he returns 57 yards to put the Steelers up 17-7. Lot's of postgame material. A special thanks to Keith "Crash" Froehlich for generously providing us with this historic game.